Explore the amazing techniques in colored pencil that will give your artwork the rich look of paint. You will begin with value exercises and basic layering techniques that will serve as a foundation for more advanced work. While prior drawing experience will enhance your study of colored pencil, it is not necessary. The instructor will lead you through easy techniques for laying out your images. Working with white charcoal on dark background paper each student will create a dramatic piece of artwork. Choose from a wide variety of subjects such as harvest moon, cornucopia or wild turkey to complete up to three pieces. No drawing skills necessary; work from a lightbox. Learn to examine the details and majesty of our winged friends in this class. 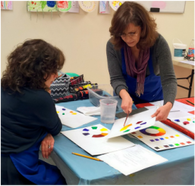 Students will complete studies of a collection of different birds in watercolor, including owls and waterfowl. All levels welcome. Learn the foundations of classical watercolor working with techniques of “wet on wet” and “dry brush.” Subjects will be simple landscapes with the goal of learning watercolor control to produce small finished paintings. Continuing students will work on more advanced techniques. Coastal excitement at its best! Students will learn the skills to paint realistic seascapes including beach, waves, skies, sand shadows and other seashore related subjects. 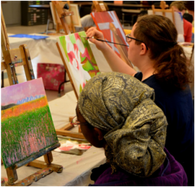 Using acrylics and watercolor, students will complete several pieces. Some previous painting experience is helpful. Learn to see color and values and meet all the challenges while having fun working in this medium. You will learn all of the techniques needed to create a beautiful finished piece of art. All levels welcome.